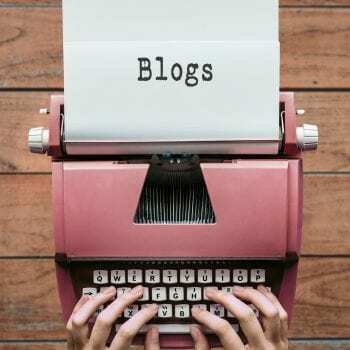 If we have a blog and if we are also willing to earn a fortune from it then there is no doubt that we will opt for AdSense as the primary mode for generating revenue. However, the problem is, many of us don’t know about AdSense or how to create an AdSense account. Or maybe we know about AdSense, but we still need to know the exact procedure to follow to apply for an AdSense account. Well, if that is the case, then we need to go through this blog in full as this blog details all the necessary steps and the hygiene measures that we need to religiously follow when we apply for AdSense. In this article, we will understand about AdSense and its application process. Plus, we will get hold of the key terms used in AdSense. 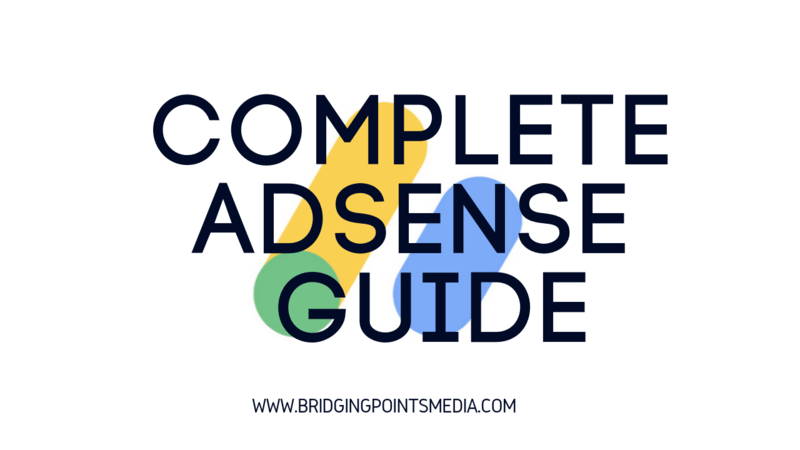 AdSense is a subsidiary of Google and an Ad Network comprising of an ad server through which the advertisers serve their ads on publisher’s blogs/websites. Google provides complete real-time analytics through a dashboard to both advertisers and publishers about the ads served. All of these ads are either impression based or click based. If we are displaying ads on our blog/website we generate revenue either for the impressions being served on the site or if a user/visitor click on these ads. If we run a blog or run a website with significant traffic, we can make millions. We repeat millions. There are several other Ad Networks; however, AdSense is the most preferred because it pays more than any other Ad network. For instance, if other Ad networks pay $0.01 – $0.10 for a single click, then Adsense pays about $0.01 – $10, $20 even $100. And this is entirely dependent on the type of ads displayed, the advertiser’s bid and budget for the ad and also is also a factor of the nature and volume of traffic the blog/website generates. The advertisers fund Google for displaying ads on several sites (Publishers’ website/s) and in turn, Google compensates the Publishers displaying these ads. Advertisers: They are companies who pay Google for displaying ads on several sites. Google runs scripts on these sites that display ads. 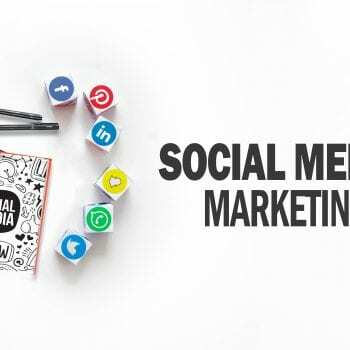 Publishers: They are digital media houses, companies/individuals that own, run or manage publications who display ads on their site/s via AdSense. If we have a site/blog and we are displaying an ad, then we are a Publisher. Google’s script serves and rotates ads of various advertisers who have either opted for our site or for the audience available on the site. In short, Advertisers pay, Publishers, get paid via the Google AdSense program. We might now wonder, whether publishers receive the entire amount paid by the advertisers or some specific amount. Publishers get 68% of the money provided by Advertisers to Google for displaying ads. For instance, if an advertiser pays $10 to Google for a single ad click, then a publisher will get $6.8 which is 68% of $10. And the remaining $3.2 is kept by Google as a service charge. Impressions: This is the number of times the ad is served on the site. CPM: Cost per Mille, it is the cost that an advertiser pays per 1000 impressions. CPC: Acronym for Cost per Click. It is the amount which an advertiser pays for a single ad click. It is the amount which gets deducted from the advertiser’s account when a click is made on the ad. CTR: CTR is short for Click Through Rate. How do we calculate CTR? We divide the number of unique clicks by the number of ad impressions to calculate the CTR for our online ad/s. For example, if we generate 20 clicks on an ad for 1000 impressions served, we divide 20 by 1,000 to get 0.02. Multiply this result by 100 to calculate the CTR as a percentage. The industry average CTR is 0.3. Higher the CTR, the better the ad is performing. However, these clicks should be genuine otherwise Google will penalize us and our AdSense account will be at stake. Estimated Earnings: When we open AdSense, we come across the term ‘Estimated Earnings’. Most of us don’t have clarity on this term. Estimated Earnings are the earnings estimated by AdSense which we have earned by serving Google AdSense ads. The amount we see here is kept under surveillance to verify if we have by any means tricked AdSense to earn this revenue. If we have not engaged in click fraud or have not done anything wrong pertaining to the ad/s or the site/s, we will receive (almost) the same amount as is shown in Estimated Earnings. Finalized Earnings: As the name suggests, it is the final amount which we receive at the end of the month /after a specified tenure. eCPM: eCPM stands for effective cost per thousand impressions. eCPM is calculated by dividing total earnings by a total number of impressions in thousands. It is a great performance measure for our various ad units, so we can use eCPM to compare our results. eCPM helps compare media with different pricing methods by converting everything to a common metric. This can be helpful when we have a mix of ad buys denominated in cost per impression, cost per click, cost per lead, cost per action, fixed-price sponsorship, or other pricing methods. Sometimes, eCPM is used to refer to revenue per thousand impressions on the publisher’s side. As long as we have information for cost and impressions, we can calculate eCPM. RPM: RPM is the page revenue per thousand impressions and is calculated by dividing the (estimated) earnings by the number of page views received, then multiplying by 1000. RPM calculates the collective CPMs for all ad zones on a publisher’s page, while CPM refers to the cost an advertiser is willing to pay for a singular ad zone. If we want an Adsense approval, then we must either have a Blog or a Website or a YouTube channel. 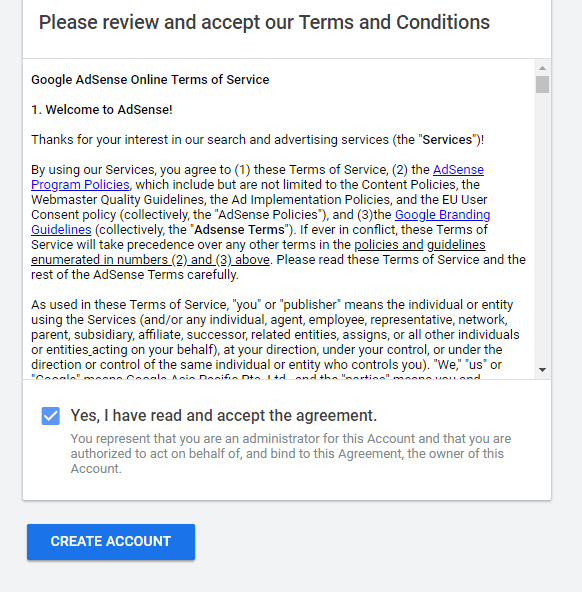 To get an Adsense account, we have to apply for it. 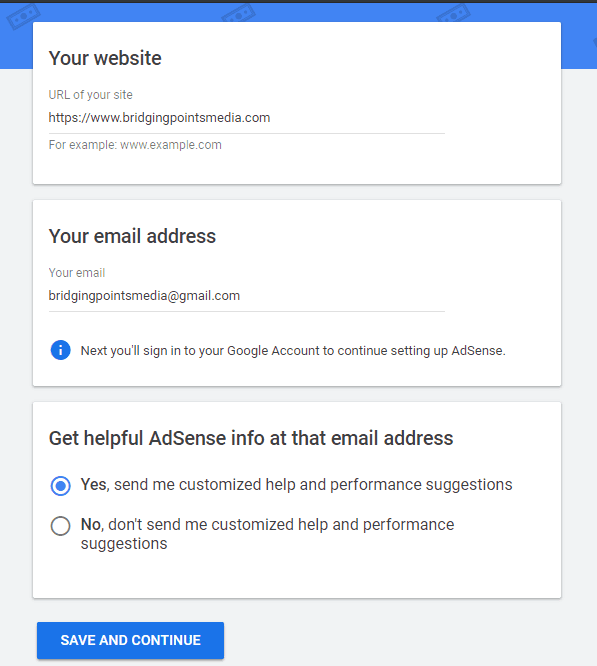 To apply for AdSense, we must first have a Gmail account. 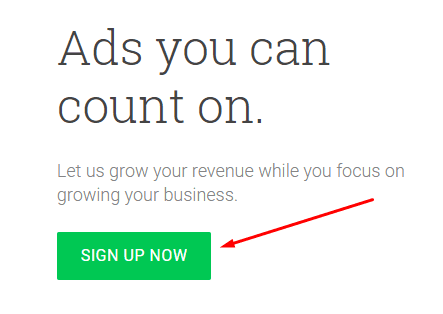 Go to Adsense, and click on Sign Up Now. It will ask us to log in, we now need to log in with our Gmail account. Once we are logged in, we will see a form, we need to just fill it with proper and real information; our name, our e-mail id, etc. Click on ‘SAVE AND CONTINUE’. Thereafter we will see the next window asking if we want to make any modification in the details that we have submitted, cross-check all details and click on ‘SAVE AND CONTINUE’. We will then get a code by Adsense, which we need to paste between <head> and </head> tags. Just copy the whole code and paste it. For 7 days Adsense will serve test ads and if it finds that the serving is as per its norms then it will start serving real ads for us to generate revenue. If AdSense approves our application, Congratulations! It’s party time!! We should not hurry and take due time before we apply for an AdSense account. If we are new in blogging, we should have patience and tie all our loose ends first before requesting Adsense approval. To get Adsense approved with ease, our blog must have at least 25-30 posts, because this will create an impact on Google that we are taking our site seriously and will, therefore, take care of our visitors too. The length of the articles or posts should be 500+ words. Although 300+ words are enough, for better results and even from an SEO perspective, it should be 500+ words. We have studied that Google weighs favorably articles of more than 500 words. Hence, if we have posts with 500+ words, it will definitely be beneficial for us. Do not Copy-Paste articles. Avoid plagiarism at all costs. Google detests plagiarism and will soon penalize for this. Therefore never act smart with Google. Google is intelligent and will disapprove our application. Proper navigation, i.e. the site should be well structured and visitors must know how they are moving through the site. It is advised not to include any redirection to any unauthorized or pirated site; it should not have any download links or malware, even better avoid pop-ups and pop-below as far as possible. Our website must not have any content that is related to Gambling, although we can contact Google for further acceptance as a special case as some Gambling websites are allowed to show ads by following some additional set of rules. If our blog has an adult, violent or racial content; be certain that the Adsense application will be rejected. Further, if we add adult content to any Adsense approved site, then our account will be permanently banned. If we are using any copyrighted content such as Images, Videos or any other pirated material; we will be soon left with a suspended account. If we are trying to play tricks with Adsense ads, such as customizing it, then we can be certain to get a mail from Adsense regarding our account being suspended or banned. Customizing ads are against Google Adsense policies. Further never try to generate clicks through tricks such as placing ads that cover content and asking visitors to click on the ad to see the underlying content. This will be a reason to have a suspended Adsense account. It is advisable not to encourage visitors to click on ads. Refrain asking for clicks on the displayed ads. If we do so, it will be taken as an invalid activity and as a result, our account will be suspended or banned. It is wise not to ask our family members, siblings, friends, etc. to click on ads because IPs are recorded and may result in a suspension. Did we accidentally click on our Ads? Google is very friendly; it understands that sometimes we click on our ads accidentally and so Google will not penalize us for this. We should genuinely take care of this, if we click on an ad by mistake, we should close it as soon and as fast as possible. Please share your insights, questions and views in the comment box below.